Finally, at the end of 2016, Americans are optimistic – albeit cautiously – about the new year. 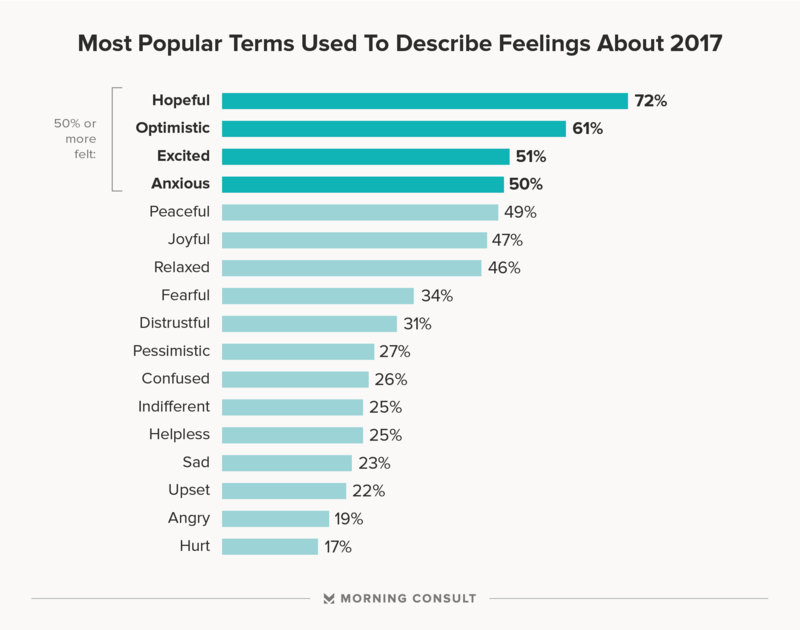 Seventy-two percent of people said they are feeling hopeful about 2017, and 50 percent said they’re anxious, according to a new Morning Consult poll. People are putting a lot of stock in leaving behind 2016, too – 51 percent of people said they’re excited about 2017, compared to 23 percent who said they’re sad and 19 percent who feel angry about the new year. Some Americans, however, are still wary of what’s next. Less than half of those surveyed – 49 and 46 percent, respectively – said they’re feeling peaceful and relaxed about 2017. Fifty-five percent of people said they think 2017 will be better than 2016, but when asked why, people were not optimistic about America or the rest of the world. Eighty-one percent of Americans said they’re concerned about the nation’s political atmosphere and 64 percent reported being worried about world affairs. While both women and men are worried about domestic politics, 87 percent of women are concerned, compared with 74 percent men. Seventy-one percent of people ages 30-44 reported being worried about the political atmosphere in the U.S., the lowest among all age groups. On a personal level, respondents overall are optimistic about next year. Fifty-nine percent said they anticipate doing better financially in 2017. Only 33 percent of people said they have a specific resolution for 2017. Among those who are making a resolution, they want to take better care of themselves physically, financially and emotionally. Sixty-two percent of people said losing weight is a goal for the new year, and 85 percent said they are focused on staying fit and healthy. Eighty-one percent of people want to spend less money and save more, while 79 percent of people want to spend more time with their friends and family. This poll was conducted among 1,562 U.S. adults from Dec. 16 through Dec. 19. Toplines are available here and crosstabs are here.